I hope you’re having a great start to the spring. I am! Actually, three very exciting things happened to me today. One, it was warm enough to sit outside in the garden and read for the first time this year (yay! and not long till I get the hammock out, woo hoo!!). Two, I got a gorgeous planted tub of flowers from the lovely Hazelwood School in Oxted as a thank you for being involved in their book week and, best of all, I went to visit the book group in my local library, Haslemere Library, just down the road (and past the cupcake shop – yum!) from where I live. I go to the library a lot, as they have a great children’s room which Holly and Freddie love, full of books and toys. I also like to borrow books for myself and to use their study room to work during the school holidays when my house is (ahem!!) a bit noisy, to put it mildly. Once when I was there I saw a girl taking out my Pony Camp Diaries books and I nearly went up and said, ‘Hey, guess what, I wrote those! !’ but I didn’t because a. I was too shy and b. I thought she might run away, thinking I was a bit crazy! 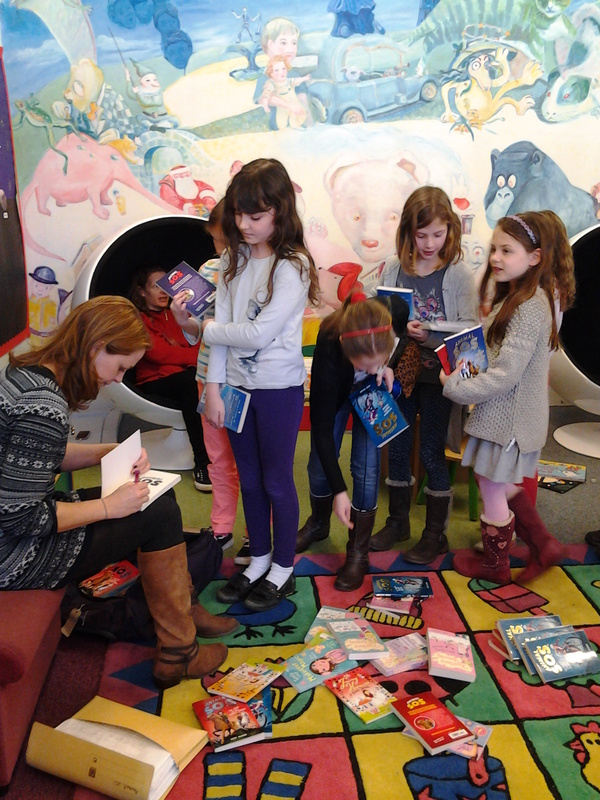 Well, luckily they liked the books (phew!! ), and they gave some insightful reviews and comments on them. Here they all are with me and the lovely Nikki Barton, a Surrey County Councillor and generous library supporter, who came along too. Best of all, I got to show the group the (very heavy) folder full of rough drafts and notes and initial illustrations that go into making the final book. They really enjoyed riffling through all these bits and pieces, and I hope it helped to demystify the process of making a book. It really does start with a few scribbles, as they saw! They had some great questions too, and I’m planning to go back when I begin my next middle grade series and find out which ideas and plots excite them the most. I’m sure I’ll be seeing some of their names on their own book covers, or on whatever awesome digital reading tech we have in the future! I loved signing books for them too! 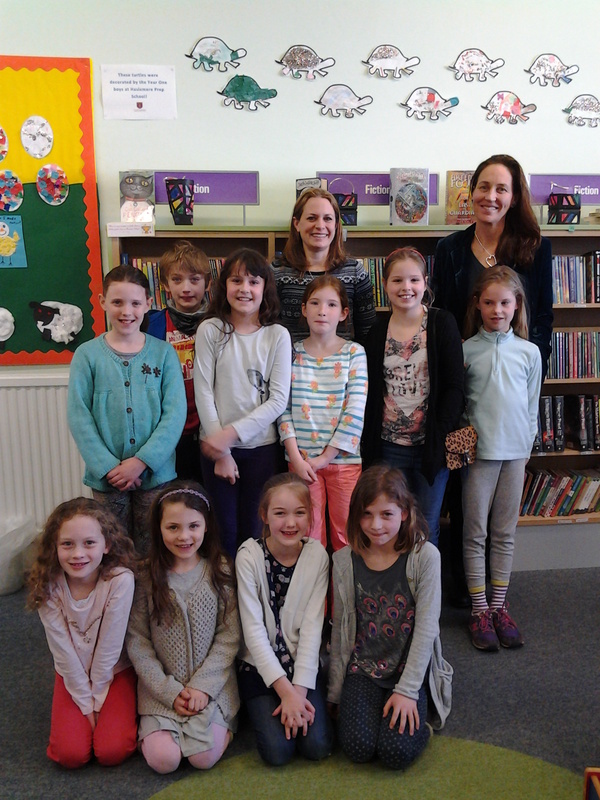 So a big thank you to them all *waves to book group*, and to Erin and all at Haslemere Library for a fantastic day. And don’t forget to check out your local library or your county’s libraries website – there may be a book group already going that’s just perfect for you – or perhaps you could even grab a couple of friends and start your own! 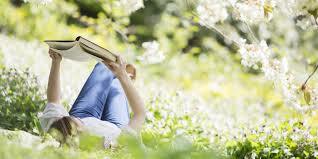 Happy reading in the just-warm-enough Spring sunshine, everyone! Tags: book group, book groups, books, libraries, library, reading, writing. Bookmark the permalink. As a children’s book author and artist I’ve done a number events at schools, bookstores, toy stores, etc. It’s always wonderful to meet young kids who are reading and writing their own stories. At some of these events, I encourage children to publish their own stories and share with them a number of websites that they can use, including Scribblitt. I have also published for my two granddaughters books of their writings and drawings on Blurb.com. They feel so proud to see their work in print and it encourages they to do more. Currently, I am working on my ten year old granddaughter’s second grade writings and drawings. She’s now in fourth grade so I have a lot of work yet to go. These books become keepsakes and they can see how far they have come. Grandparents also like to receive copies. Blurb is an easy site for those who are computer savvy. I encourage all parents and kids to publish, publish, publish!! 2004. IGF1 Severe Matrix Deer. 2004. IGF1 Extreme Factor Deer. Kelly? Is this you? Really? Greetings from Turkey! I read Totally Lucy book one when I was 12 years old! I’m very like it.Kelly, i love you, Lucy so all books!